Sean Collier Memorial, Massachusetts Institute of Technology, 2015. Image Courtesy of Höweler + Yoon Architecture, © Iwan Baan. 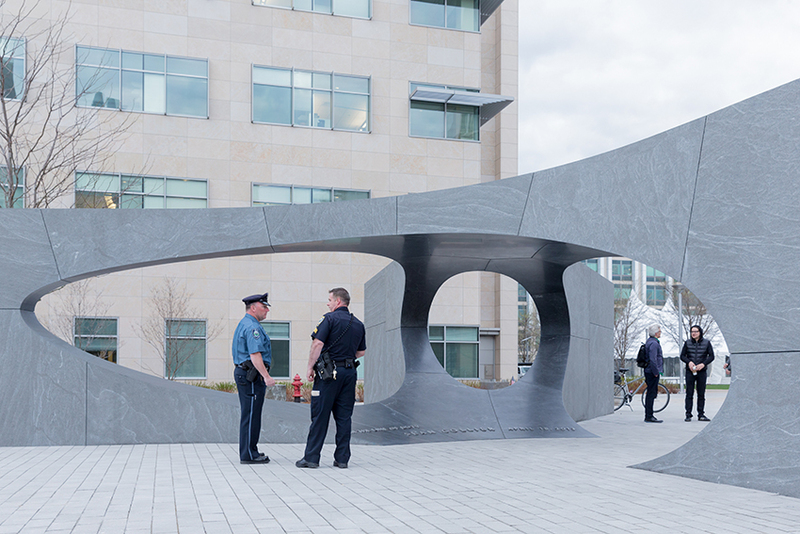 The Massachusetts Institute of Technology Collier Memorial commemorates the MIT police officer killed during the 2013 Boston Marathon bombings, translating the slogans “Boston Strong” and “Collier Strong” into a unique structure that highlights strength, stability, equilibrium and interdependence. The memorial is composed of thirty-three blocks of solid granite, forming a shallow vaulted structure with a “conspicuous absence” at its center, a sheltered space. Despite the ancient origins of this arch structure, the memorial was designed and fabricated using highly sophisticated computational tools. It was delivered through an unusual project delivery structure that transformed the architect’s instruments of service, their design documents, into files and protocols for implementation and fabrication—an approach that signals a larger paradigm shift within the discipline and the building industry. Sean Collier Memorial, Massachusetts Institute of Technology, 2015. Courtesy of Höweler + Yoon Architecture. The one hundred and ninety ton-memorial is a compression-only, balanced, rigid body system—otherwise known as an arch. Loads transfer laterally from the center keystone into five irregularly arrayed buttressing walls. There are no tension elements, just solid stone, cut into to a precise and unique wedge-like geometry—in other words the structure was extremely deflection sensitive. The lack of these tension members, coupled with the monolithic construction, deflection sensitivity and 1/4” joints with almost zero tolerance, meant that the structure required a level of extreme precision beyond normal, accepted tolerances of the trade. The stone fabrication therefore had to maintain a tolerance of less than a fraction of a millimeter. 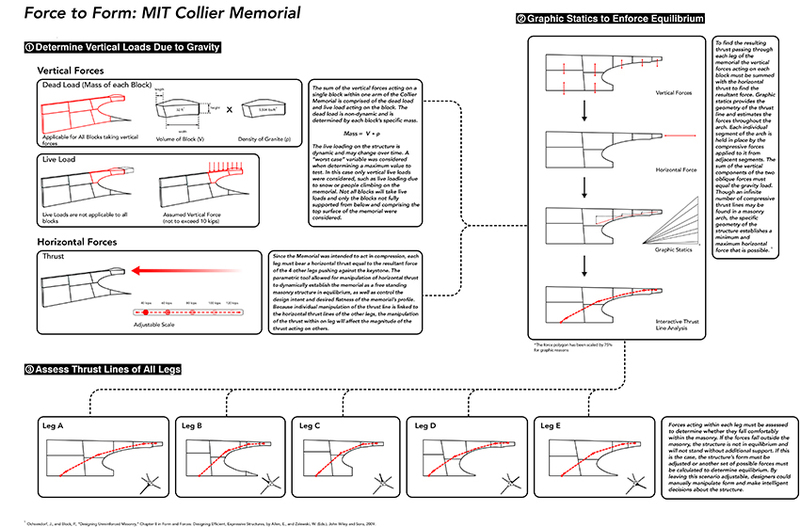 Spanning thirty-six feet in length and twenty-eight feet in width, the MIT Collier Memorial is a seemingly impossible, shallow arch. It relies on the exact fit of each stone block—forming the arch through compression alone. A lateral displacement of 1mm translates into a vertical displacement of 6mm. 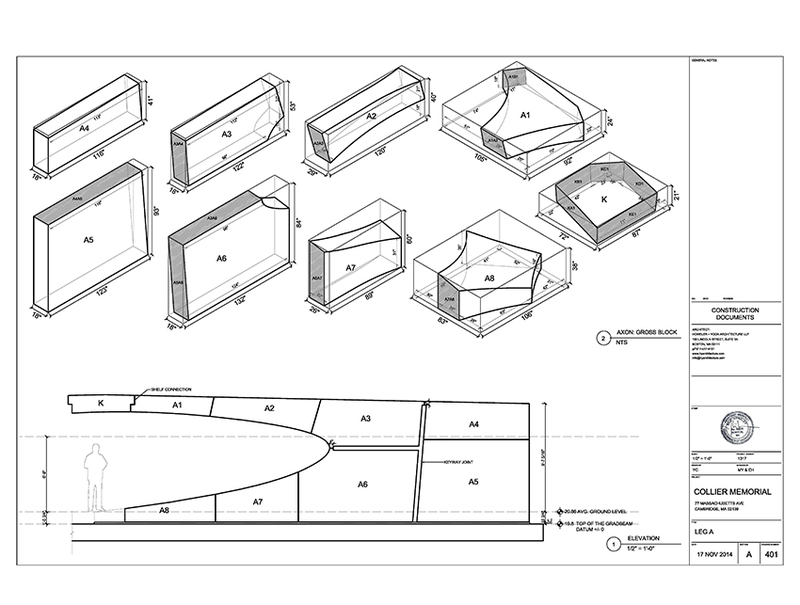 The design team studied the form of the memorial relative to the geometries of thrust vectors and under all combinations of load cases. The shallowness was achieved by verifying the thrust geometry within the buttress walls, using a combination of digital tools—custom software tools—physical model simulations and mock-ups. The design workflow involved an iterative process of block definition and a thrust analysis to verify the overall structural equilibrium and stability. 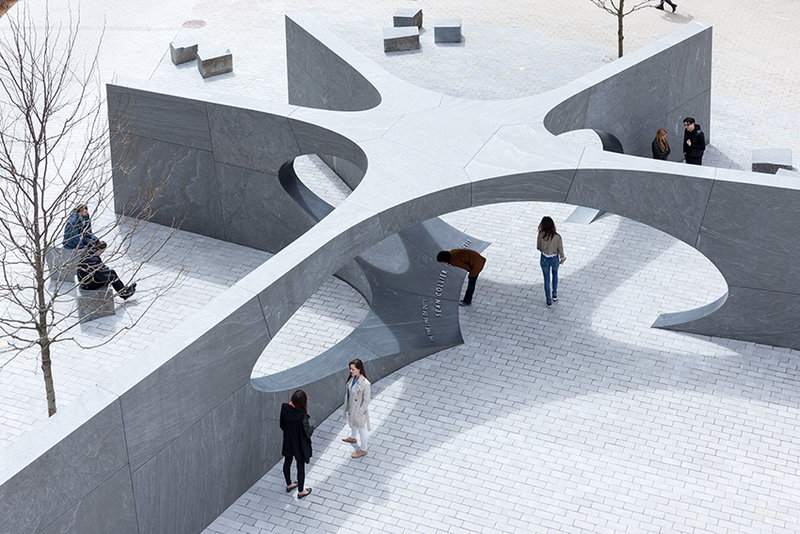 Ochsendorf DeJong + Block Engineering developed a custom parametric tool that allowed the design team to manually control design decisions while the memorial fell within a threshold of structural stability. The parametric tool ensured that stones would be in equilibrium under gravity by finding a compressive line of force through the masonry. The model utilized graphic statics to perform a three dimensional calculation of the resultant forces of each stone, combining downward gravitational force and horizontal thrust—thus determining the stability of each leg. 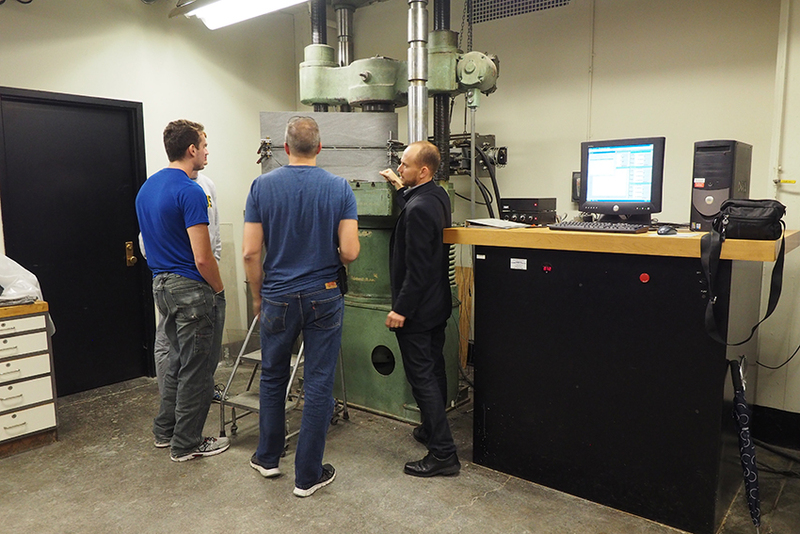 In addition to computational modeling, the design team performed a number of physical material tests. Physical models made of foam, wood and 3D prints simulated structural stability under lateral loading conditions. Material tests performed on the granite blocks confirmed the compressive strength of the material. Because the maximum material stresses in the stone vault are far below the compressive strength of the Virginia Mist granite (290 MPa), the stability of the structure was a dominant concern, rather than the crushing of the material. Procurement of the thirty-three unique blocks involved hand-picking granite in a quarry. Because the blocks varied in size—and many exceeded the standard sizes being quarried—the design team worked with the quarry to select and cut material based on custom dimensions. 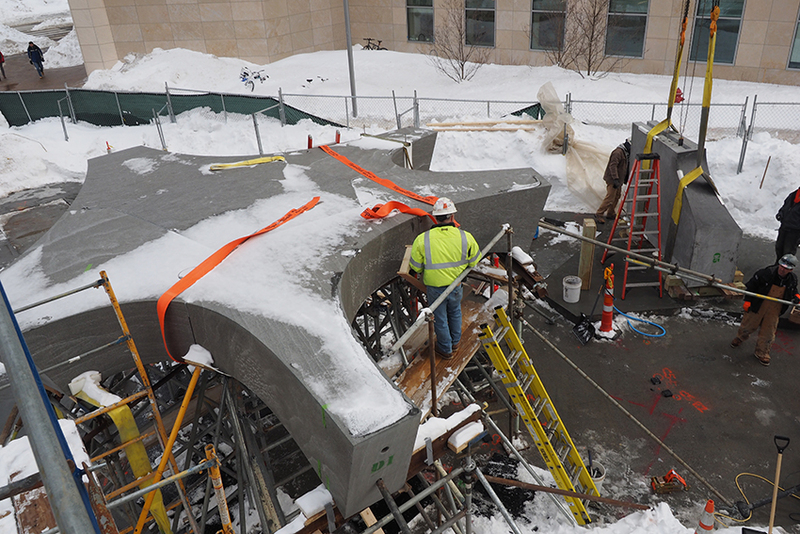 The granite blocks were carefully inspected for imperfections and fractures, which could cause local failure and impact the overall structural performance of the memorial. 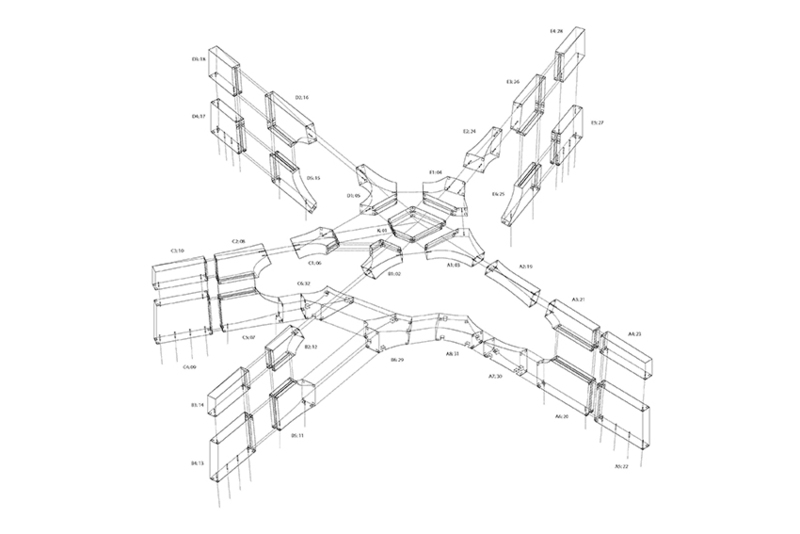 The 3D control model was used to select rough quarry blocks, and to confirm that the memorial’s geometry fit within the “bounding box” of the block with sufficient dimensional tolerance for cutting and subtracting. 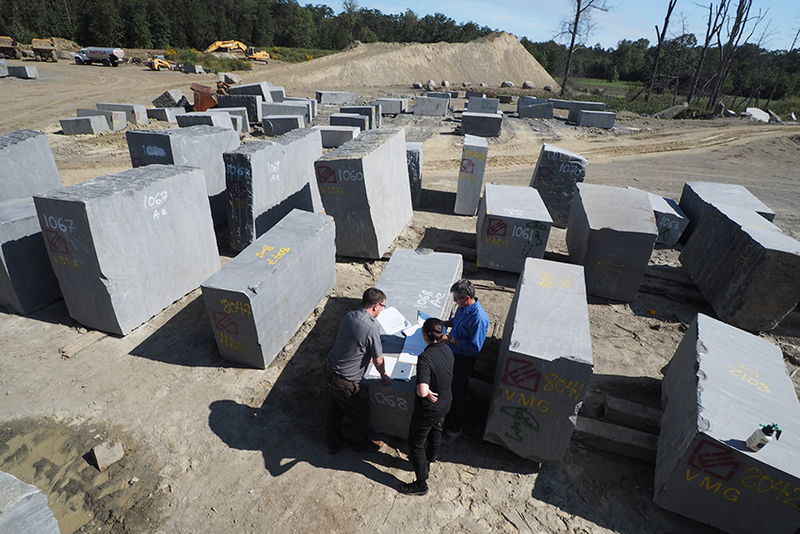 Once all parties agreed on the overall block subdivision, and individual stone blocks were procured, efforts shifted to the stone fabrication process—an absolutely flawless fabrication of blocks to extreme tolerances. An overall three-dimensional model was used to produce shop “tickets” for each unique block. 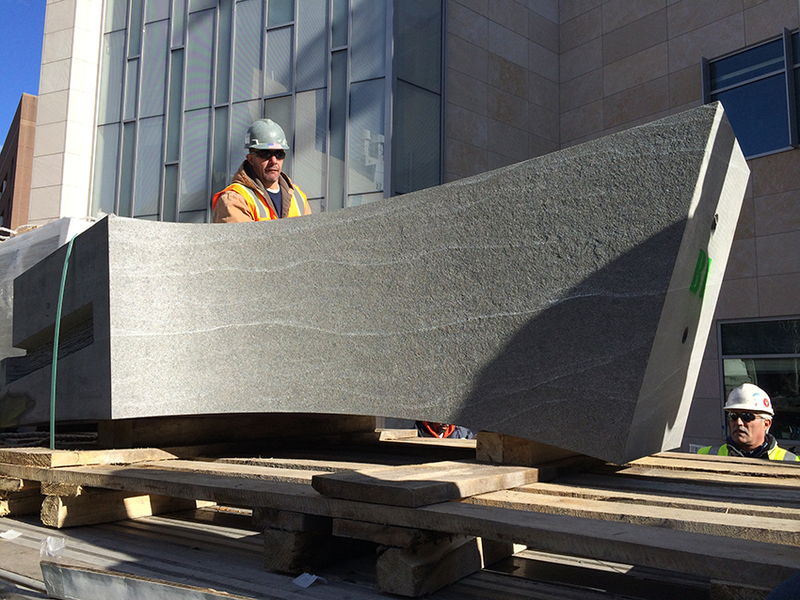 The stone fabricator, Quarra Stone, developed a specific fabrication sequence and tool assignment for each block customized for its size, weight and sequence. 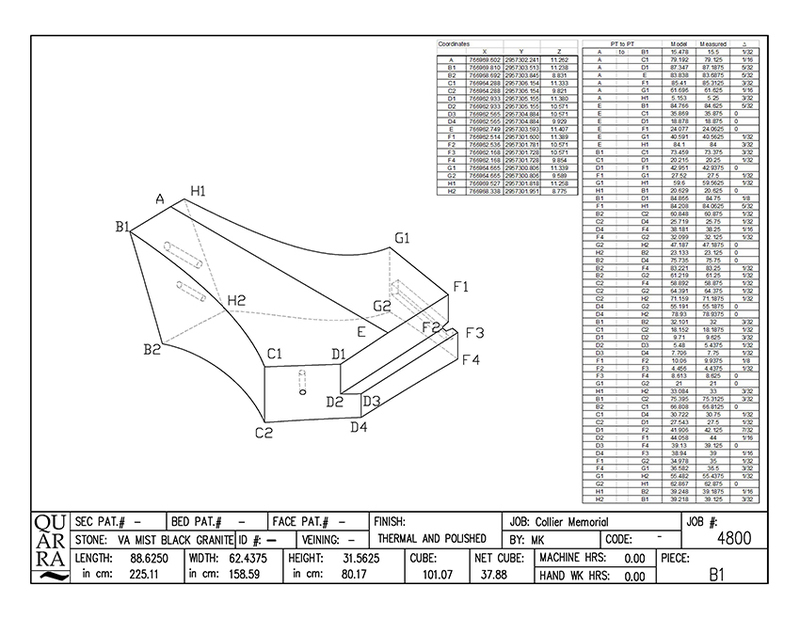 The three-dimensional file transfer from the design team to the fabrication team collapsed the typical separation between design documents and fabrication, or shop drawings. Additional methods of quality control and quality assurance were developed to ensure the dimensional tolerances demanded by the compression-only design. Stone fabrication involves the precise subtraction of material from the rough cut quarry block. 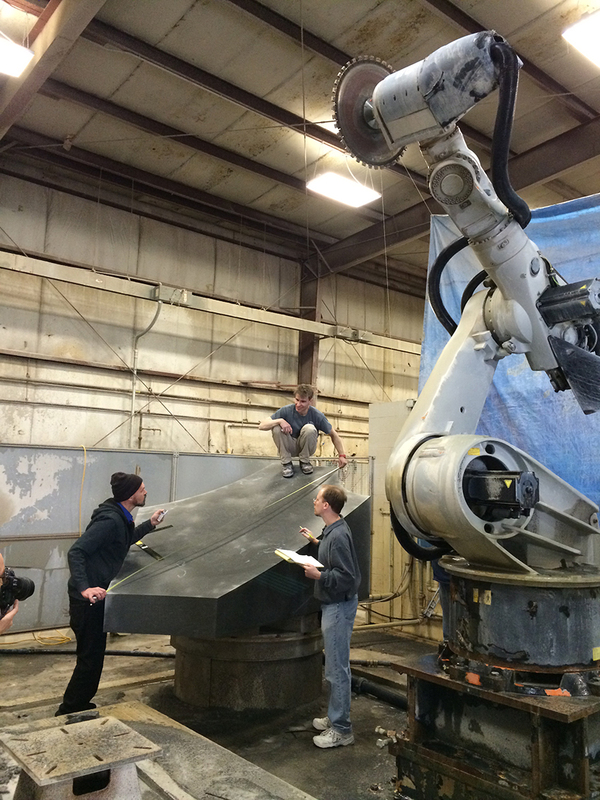 A combination of saws, CNC machines and robotic machines removed excess material from the blocks until the exact geometry of the memorial units was achieved. Because of the stone’s hardness and density, the saw blades were also worn down, requiring a constant recalibration of cutting tools. 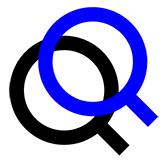 In order to verify the dimensional accuracy of the blocks, new techniques—manual and digital—verification and quality control were required. Virginia Mist granite was selected for its structural performance, as well as its unique grain characteristics. The stone’s white “feathering” veins create a pattern that “turns the corner” of the solid blocks, emphasizing that the stone blocks are solid and three-dimensional, not a “veneer.” A combination of flamed, and highly honed, finishes accentuate the difference between the rough exterior finishes and the smooth interior finishes that line the central void. As the stone blocks arrived on site, they were assembled sequentially from center to periphery, requiring the five-sided keystone to be “placed” first as the supporting buttresses were built around it. This “reverse” sequence relied on a highly precise digital survey of the blocks on site—ensuring that the most complex blocks were located first and that the buttress walls were able to “absorb” any tolerance towards the perimeter. The stone blocks were erected on scaffolding “falsework” to support the weight of the stone until the buttress walls were able to transfer the loads. Digital scales positioned under the scaffold were able to monitor the transfer of weight from the center keystone to the supporting legs. As the scaffold was lowered in the center, the scales revealed the development of “arching action”—signaling that load was successfully transferred to adjacent stones and to the buttresses. 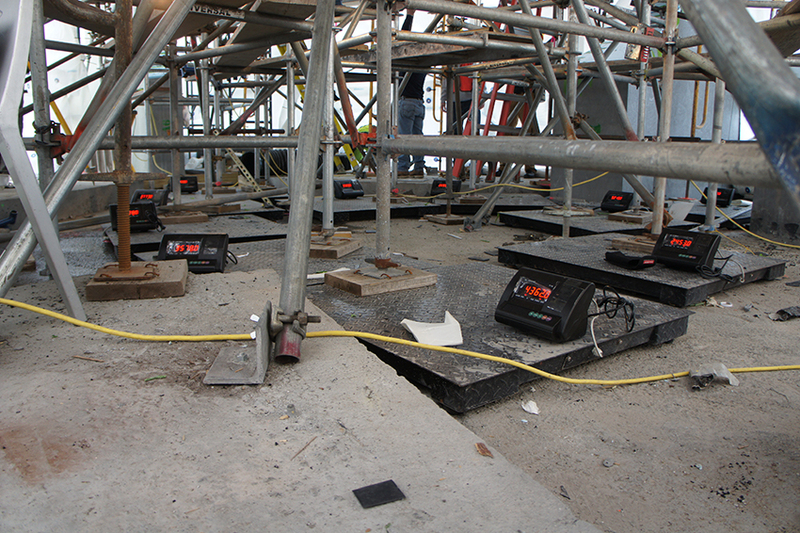 By monitoring the key survey points and joint alignments during the construction and the lowering of the scaffold, the design team was able to verify calculations for settling under its self-weight. 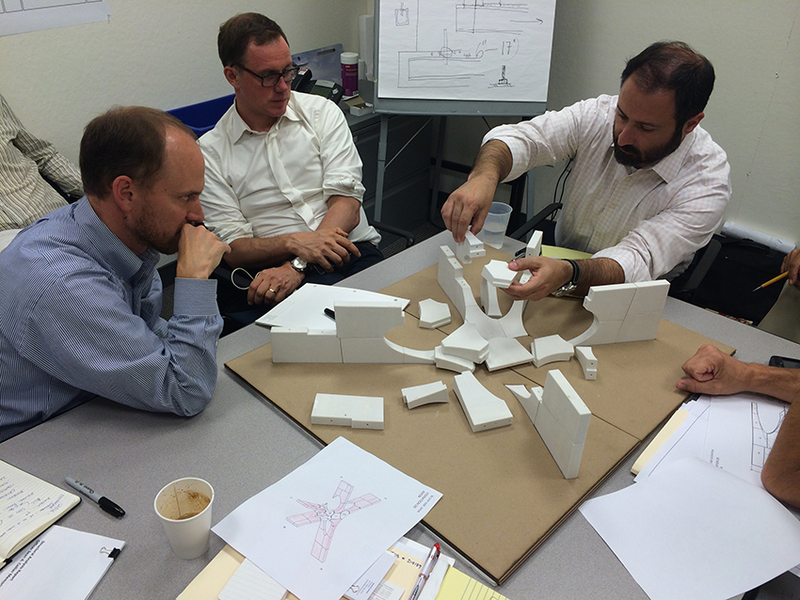 Eric Höweler, AIA, LEED AP (b. Cali, Colombia) is a architect and co-founder of Höweler+Yoon Architecture. A registered architect with 20 years of experience in practice, Höweler is also an Assistant Professor at the Harvard Graduate School of Design. He is the co-author with Meejin Yoon of Expanded Practice: Höweler + Yoon Architecture / MY Studio, published by Princeton Architectural Press in 2009 and author of Skyscraper: Vertical Now, published by Rizzoli/Universe Publishers in 2003. J. Meejin Yoon, AIA, FAAR (b. Seoul, Korea) is a Korean-American architect and designer. In 2014, Yoon was appointed as the first female Head of the Department of Architecture at the Massachusetts Institute of Technology. Yoon’s work has been widely recognized and has won international acclaim for its innovative and interdisciplinary nature. She is the author of Expanded Practice: Projects by Höweler + Yoon and MY Studio (Princeton Architectural Press 2009), and Public Works: Unsolicited Small Projects for the Big Dig (MAP Book Publishers 2008). Höweler + Yoon is a internationally recognized architecture and design studio founded in 2005 by principals Eric Höweler and Meejin Yoon. 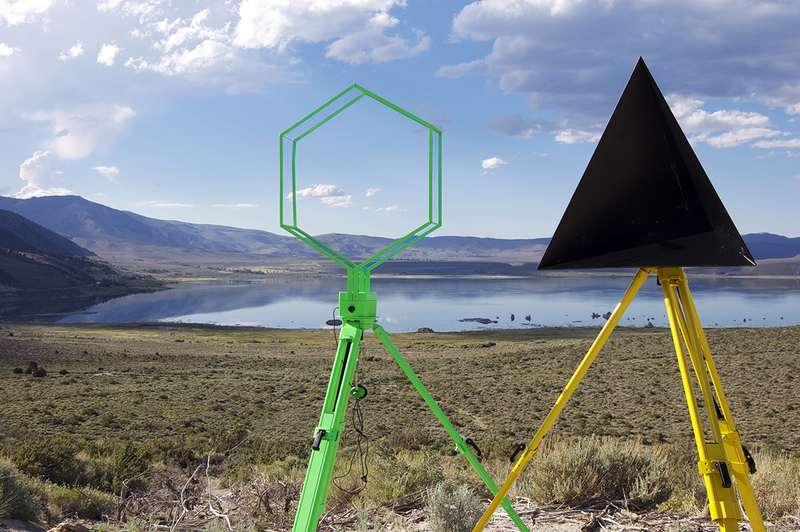 Engaged in projects of all scales, the award-winning multidisciplinary practice operates in the space between architecture, art, and landscape. Engaged in academic, institutional, civic, and cultural projects, Höweler + Yoon is committed to both the practice-of and prospects-for architecture. From concept to construct, Höweler+Yoon is determined to realize the built idea and to test projects through the dynamic interaction between the construct and the larger public.